No one likes to hear that they have a cavity and need a filling, but children tend to take it much more to heart than adults do. Here are some ways you can help prepare you child for getting a filling, and turn the situation to your child’s future advantage. Learning that your child has a cavity is never welcome news. Children can sometimes get very upset about it, and parents tend to feel guilty. While cavities are never a good thing, there are ways to make the process of getting a filling less stressful for your child, and to use the situation as a learning experience for both of you. In spite of our best efforts, sometimes cavities just crop up. It happens. The important thing is that the dentist has found the cavity, and can repair it. Plus, now you and your child both know which spots in his or her mouth need more attention during the at-home oral hygiene routine. Prepare your child for the filling appointment with basic, age-appropriate language. Depending on how old your child is when the first cavity occurs, the language you use to explain what will happen during the filling procedure will vary. For younger children, just explain that ‘the dentist is going to clean the sugar bugs out of your tooth,’ and leave it at that. For older kids, explain that the dentist will clean out the area and patch it up, and it’ll be over before they know it! 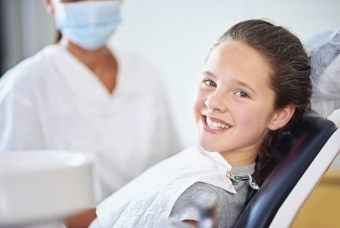 At Smile Town Langley, we provide a variety of safe, effective sedation options for children who feel very nervous or afraid about their dental procedures. Get in touch with our office to discuss whether sedation is right for your child. Now that you know that a portion of your child’s oral hygiene routine needs some work, you can focus more attention on that area. Whether it’s a question of taking more time to floss carefully, or making sure those back molars get a good brushing, we can help you and your child learn the techniques necessary to avoid cavities in the future.